Expect to notice a change in the content (if not quality) of future commercials advertising EpiPens—at least if you live in Oregon. State Attorney General Ellen Rosenblum has reached a settlement with pharmaceutical company Mylan Specialty L.P. for “misleading EpiPen advertisements.” Henceforth, before airing commercials for EpiPen and EpiPen Jr., Mylan must submit the commercials to the Food and Drug Administration; the company must also pay $250,000 to the state of Oregon. Mylan, for its part, denies any wrongdoing. 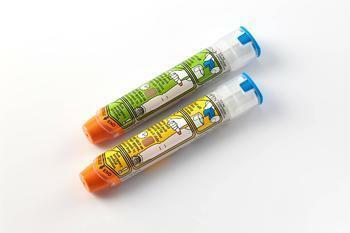 EpiPens, which cost around $400 for a set of two, are carried by people with severe life-threatening allergies. In the event of an allergy attack, allergy sufferers use the “pens” to inject themselves with a dose of epinephrine, which can offset such potentially fatal allergic reactions as anaphylactic shock and throat passages swelling badly enough to prevent breathing. But, according to AG Rosenblum’s office, Mylan went a little overboard in its national TV commercials for Epi products, telling parents that with EpiPens, they need not worry about their children being exposed to potentially deadly allergens. The Oregon AG’s office also said that Massachusetts Attorney General Martha Coakley is considering a “related investigation” against Mylan’s EpiPen marketing. Despite the Oregon legal action, no one is suggesting that EpiPens are unnecessary or that they aren't lifesavers when severe allergy alerts occur. In fact, Congress passed a bill just last week today that would help fund school efforts to fight allergy attacks. The U.S. Department of Education currently offers grant money to states in which schools are taking steps to prepare for asthma attacks. Under the newly passed H.R. 2094, the department would prioritize those funds to benefit states where schools also prepare for allergy attacks by having a stock of epinephrine (EpiPen), and staff trained to use it. In a statement released after the Senate voted, House Democratic Whip Steny Hoyer (D-Md.) and Rep. Phil Roe (R-Md.) praised the legislature's decision, and urged President Obama to sign the bill into law. "As the grandfather of a child with severe food allergies, I know all too well how critically important it is to administer life-saving epinephrine in the minutes following the onset of an anaphylactic attack," Hoyer said.